Sauti Sol’s live concerts are an eclectic display of showmanship, which yields more enthusiasm for their energetic rhythms and electric performance. Their vibrant personalities and sense of style – a combination of colourful outfits, from skinny jeans coupled with blazer jackets made from traditional Kenya fabric to vest tops with suspenders or a T-Shirt with an African motif, in addition to their eccentric dance moves creates a dynamic connection with the audience wherever they find themselves at home or abroad. Be it at South by Southwest Music Festival (SXSW) in the US, or on the European stage in Prague, they take Kenya and Africa with them and the audience responds. The excitement of the audience confirms what Sauti Sol already knows – that there is a market for their sound, which they describe as Afrop Pop, a fusion of Kenyan and pop influences – and it fuels their mission. 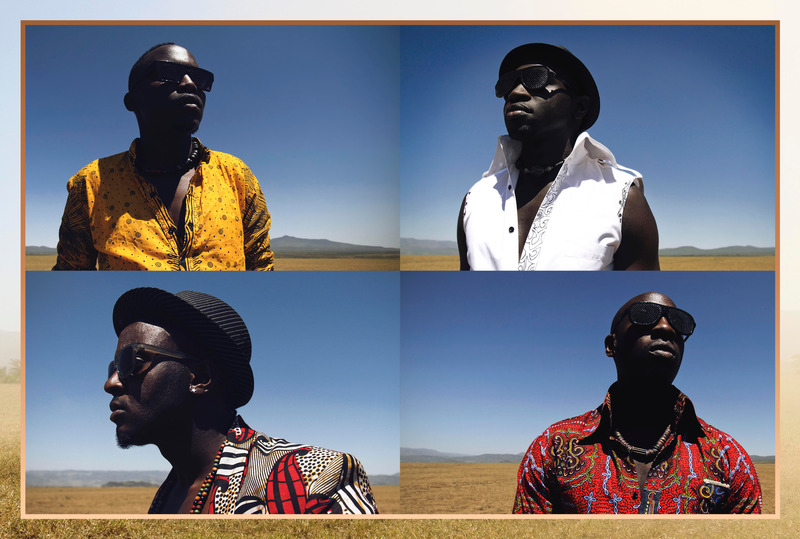 In their own words, Sauti Sol and their dreams to conquer the world. Where your music is concerned, what’s the vision? We want to be the biggest band from Africa to change the world. We are in this together. Music wise, there was a void that we saw and we are filling that void. As for our music, it will only get better, more international and as we want to be the biggest band from Africa. We want to be the best export from Africa. You want to be the biggest band from Africa and in Africa. However, how are you currently positioned within Kenya and East Africa? The thing is with our kind of songs, we want to achieve the pan-African sound as one of the cross-over goals. So we are trying to come up with our own sound by mixing the African element of our music and trying to make it pop enough for it to go global. Right now, we are working on a concrete kind of sound, which we have tried and it’s creating a bit of buzz out there. For example, there was that kind of sound that Soul II Soul has that no one else has and that’s what we are trying to come up with. As for our kind of music, we would say Afro pop and we all know Afro is African and it has that pop feeling that we want to achieve. We are doing that to have a presence in Kenya and right now we are working on a few singles that are going to have a buzz here also and based on this, we will know how we are going to penetrate the European market. The strategy we are using is first, creating a buzz at home, which we have done, and East Africa and then we spread towards America and Europe but in Africa, right now, that is where we want to start. What people have found unique in Sauti Sol is that the four of us are each special and talented and we have different things that we bring to the table. It’s like your body; it would be difficult to do things without your leg or eye, so we have each others back. 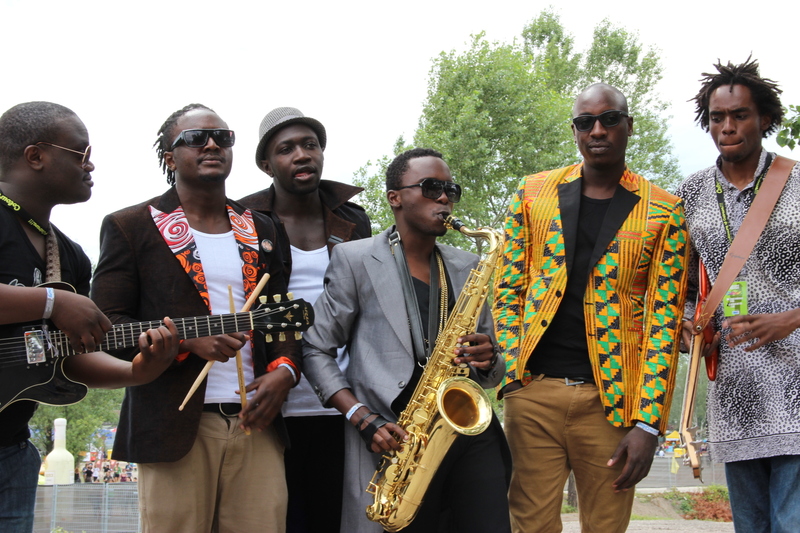 Sauti Sol – Sauti is Swahili for voice. We added Sol, which is Spanish for sun. So it’s like Voice of the Light and whenever we perform, we bring energy and people notice this chemistry that we have, there is synergy and we came at a time when live music was not appreciated in Kenya. When we started out, people started appreciating it because a long time ago, it was hard to find young people to attend live concerts. So that’s how we have been doing it here in Kenya and East Africa and hope to spread out. Your recent EP, can you elaborate on the songs that you decided to put out there for your fans? The EP was a project between us and Spoek Mathambo. It is self-titled, Sauti Sol and we were experimenting because Spoek Mathambo in his own right is known for that – he makes Afro future sounds and we thought it would be interesting to work with him and we had him over in Kenya for 6 days and went to the studio to create some sounds. It has received a lot of good vibes so far, from fans at home and abroad. It’s definitely not the usual thing we would do but as musicians, we like to be versatile and give our fans different things…we like to dictate what our fans listen to and we like to be in control and we are happy that they take what we give them. Spoek Mathambo is known for afro future sounds like you said and Sauti Sol is known for Afro pop…so what would you call this sound that you have created with him and in what ways do you think it is helping to shatter the music stereotypes and borders that people my have associated with your sound before you worked on this project? You are big in Kenya and East Africa – is it hard to maintain that status? We don’t think it is a matter of maintaining it. It’s a matter of staying focused. People fall along the way because they are not focused, consistent or know what they want and also they don’t have a global mindset. The reason we are big in Kenya is because we have toured a lot of places… for us, it’s the hard work that has brought us this fare and that’s how we want to continue. We are not comfortable with the fact that we are big in Kenya right now, so what? Have we changed the world? That’s the question? What have we done for Africa? What have we done for East Africa? We are really moved by the fact that we are big in Kenya but we want to be bigger and change the world. So it’s about being focused, working smart and if music is your sport, you watch what you eat, your movements and work out. With music, do you practice vocally…things like that? We think if you just have your eyes on the prize, you will know where you are going and if you know where you are going, you should be prepared to work for it and sacrifices that come with it. The thing is to be focused. That’s what we have done and what we pray to keep doing. Why was it important for you guys to sing in Swahili rather than in English in order to reach a bigger market globally? It’s impossible for us to sing in English better than Americans or the British. Swahili is our first language because the English will never come here and sing in Swahili better than we do. So, it’s our identity. We own it and we have the poetic licence to do as we please with the language and express ourselves with it. We speak the language, people around us speak the language and we tell stories of what is happening in society. So we want to tell the right story and use the right language to tell that story and hopefully the emotion will come across. For us, we are lucky to have Swahili and it’s a beautiful language and being able to sing in English – because you find that people, who don’t get the language, get to relate to it somehow with the mix of the languages and we have done well using both. If you are going for a global audience which is your dream and vision, are you concerned that language might become a barrier and how do you intend to navigate that space when the time comes? Well, it’s definitely a barrier. But how many people understand Yeke, Yeke, a world hit song by Mory Kanté…what we are trying to say is that music is a spirit not a language. It’s an emotion. It’s a universal language that speaks to the soul. At the same time, we are not going to be stupid about it and say we are not going to write songs in English because we are big and artistic…we are putting into consideration the language that we use and we have songs with a good percentage of them in English and Swahili respectively. We are trying to create a nice blend, where we can even teach people Swahili as they listen to our music and make them love the language. You toured Europe in 2012, what was that experience like? It was phenomenal! We spent three weeks touring different cities and countries across Europe and it was amazing to say the least. We performed on the main stage at the Colours of Ostrava festival in the Czech Republic which is their equivalent of the Cannes Festival and also at the Karlovy Vary International film festival. We also did a street party in Prague and had several other shows in Holland. I know Africa is in your sight but which stereotypes about African music or music from Kenya do you also want to break on the continent especially if there are those out there who have put a name tag on what music from Kenya sounds like? Actually we would like to put Kenyan music on the map as opposed to breaking any stereotypes as a lot of our local music still doesn’t have a definition out there as compared to South African music, part of Tanzanian music and the likes of West Africa. The stereotypes we would like to break is always being put in the World music genre just because we are from Africa. We don’t want to be out down to one genre, at any one point we will be delving out of the box and doing any sort of music we want to, after all that’s the only way we can be up against the biggest artists in the world. You have two albums out already and your third full album will not be out until 2014, what can fans expect in the meantime? We will continue making timeless music for as long as we can sing. Our next album will be out in 2014 but in the meantime we will continue on our mission to take Kenyan music to the world stage. This entry was posted on Monday, August 5th, 2013 at 11:28 pm	and is filed under Africa, African Diaspora, Art and Culture, Interviews. You can follow any responses to this entry through the RSS 2.0 feed. You can leave a response, or trackback from your own site. Interesting piece. I couldn’t help checking to see if there was a relation to the Hausa speaking people of West Africa. This is because ‘Sauti’ also means music or song in the Hausa language :-).